The Sunday after Epiphany used to be when the Church celebrates the Feast of the Holy Family, in the liturgy. The Baptism of Our Lord now concludes the Christmas season although many people have already packed up their Christmas decorations and moved on. My husband kindly reminded me last night that no one in the neighborhood has their Christmas lights on anymore, except us! Recently, you may have heard the celebrant proclaim reverently a prayer called the collect…O Lord Jesus Christ, who when thou wast subject to Mary and Joseph didst sanctify the home life with ineffable virtues: grant that by their assistance, we may be instructed by the example of Thy Holy Family and become par takers of their eternal happiness. So, you might ask what does ineffable mean? The Merriam-Webster definition of ineffable is too great or extreme to be expressed or described in words; not to be spoken because of its sacredness. Virtue is established in family life. It is our duty as Baptized Christians to emulate the ineffable virtues of the Holy Family not only in our own families but in our extended families, our spiritual Church families and beyond. While we can never possibly “be” the Holy Family, they are the model for all Christian families to strive for each and every day. The Holy Family models Ineffable virtues of love, peace, purity, humility, prayerfulness, how to do God’s will, trusting in God and how to work. The challenge lies in the contemplation of how you will emulate [JMJ] Jesus, Mary and Joseph in your own life. How are the ineffable virtues of Jesus, Mary and Joseph alive in your family? The best way is to make Christ the center of your family life, by attending Sunday Mass and Holy days of Obligation as well as daily Mass, reading scripture, and frequent reception of the sacraments, all as a family unit! Many years ago in my parish ministry role, together with our priests we orchestrated a theme for Christmas that stuck to me. 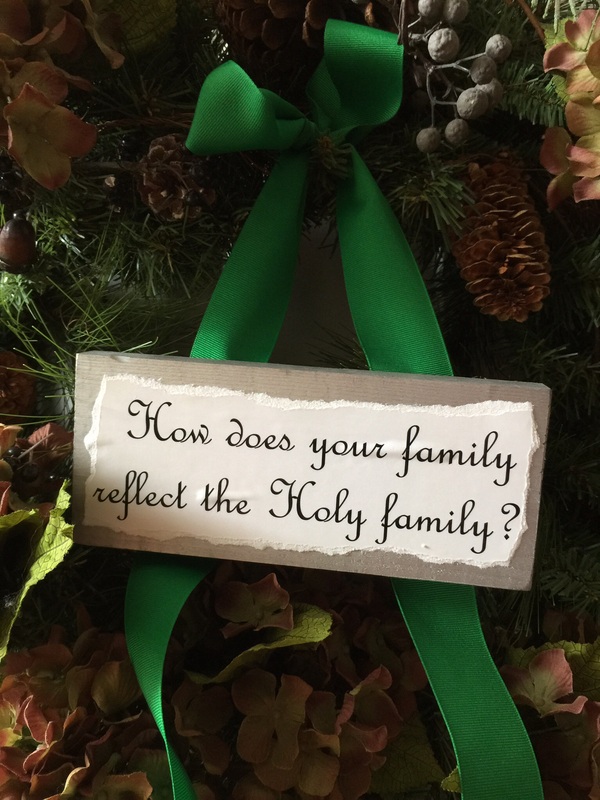 It was more than a word, it was a phrase How does your family reflect the Holy Family? Our Parish gave each family a little mirror Christmas ornament with the Holy Family on it. We took it a step further by incorporating a full size mirror on the wall behind the crèche and a kneeler was placed in front of the manger scene. It was a way for all families to bend down and visualize their own holiness. As the liturgical Christmas season comes to a close may the ineffable virtues of the Holy Family be a new beginning, a stronghold steeped forever in your heart. May we always honor Jesus, Mary and Joseph by the way we live and be open to change in our old ways.